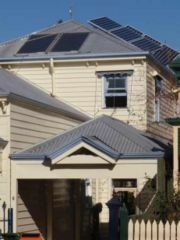 The Hawthorn house has a 2.1 kW solar array, solar hot water and water tanks installed where a swimming pool was decommissioned. 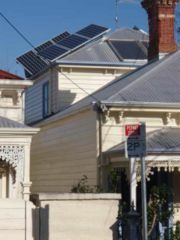 Even though the north facing part of our modest sized house roof is already occupied by two solar hot water panels, we have managed to install a 2.1 kilowatt grid-connected solar PV system, with the twelve panels mounted onto four north facing frames. Two frames sit on each of the east and west facing parts of the roof, looking a bit like two pairs of ears. Our house also has rainwater tanks of 6,600 litres capacity - one of these is buried in the hole left by the swimming pool that we removed because it used too much water and energy. The stored rainwater is used on a vegetable garden that has been established above this buried tank. This page was last modified 02:57, 26 December 2008.